Consumers are constantly looking for deals and bargains, especially in these times of recession or low economic growth. And both companies and consumers are looking at technology and mobile phone apps to make a profit. And the AmEx/Foursquare tie-up is certainly a good deal for customers, though perhaps not the best deal for the outlets. Earlier this year credit card firm American Express linked up with the geo-location social network Foursquare, offering significant savings for users who check-in to a selection of outlets. Users of Foursquare link their account to their American Express card and after checking in at one of the participating shops or restaurants on Foursquare they click a button which loads the deal to their card [tvnewswatch: Cash back for Foursquare users with AmEx deal]. The offer is certainly better than many seen before on Foursquare. Frequent visitors to a venue who checked in on the social network might become the 'Mayor' of that location and obtain benefits such as 20% off a meal or a fee coffee. Confusion can often result since staff may be unaware of the deal on offer. The AmEx/Foursquare deal is easier in that no interaction or explanation has to be made with the store. But the deal might be too good, and it is unclear how either AmEx, Foursquare, nor the participating outlets will make money. The deal currently on offer is that those that check-in to House of Fraser, Primark, Cafe Rouge, Bella Pasta, Nando's, PizzaExpress and Strada can get £10 back after spending £10. 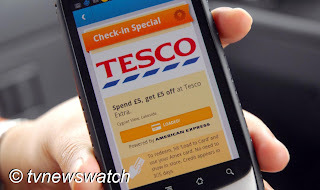 At Eat and Tesco there is a £5 cash back on a £5 spend. Since there is no requirement to spend a specific amount over the initial £10 many consumers are likely to exploit the deal to the full. 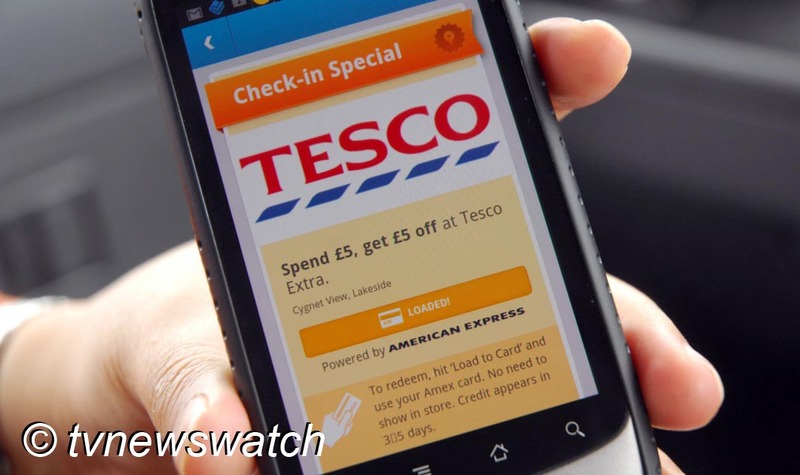 On a recent visit to an out of town shopping centre tvnewswatch checked out how well the AmEx/Foursquare deal worked. After arriving at the Lakeside Shopping Centre to the east of London, tvnewswatch checked in to Primark and loaded the deal to the card. A total of £23 was spent meaning that AmEx would re-credit £10. House of Fraser offered a great advantage since they were having a sale with many items sold with reductions of 70%. Unlike other offers the AmEx/Fousquare deal applies to all purchases. The original price of the items bought would have been over £30, but in the sale came to only £13, thus only £3 having checked-in to the store via Foursquare. Even lunch was cheap with a Four Seasons pizza and Coke at PizzaExpress coming to only £3.40 after the cashback offer. While the Tesco deal is a little less profitable, the purchase of a few supplies resulted in only a £1.18 bill instead of £6.18 !! After an afternoon's shopping £35 had been saved, not including sale offers and other reductions, and only £20 pounds was spent. After paying for the transaction a notification is received on the mobile device, however the credit takes up to a week to appear on one's online statement. Of course all this is excellent for the consumer, but even with a limited number of people taking advantage of such deals, it is hard to see how profitable this will be for AmEx or the participating businesses. Such drawbacks are perhaps anticipated since the offer on the aforementioned outlets ends in mid August. Neither AmEx nor Foursquare have made public any further details since its tie-up, and whether customers are over exploiting the offer. Indeed, the lack of publicity since its launch is probably better for all concerned, except of course the savvy shopper. One word of warning however, each account holder may only check in and save on a special at each outlet only once. For example, having made a saving at any one PizzaExpress, a user may not unlock a special at any other PizzaExpress. So given that there are in all 7 outlets offering a £10 saving and a further two giving away £5, only a total of £80 can be saved. This offer is great. I found a nice dress in Primark for £10, bought it on my synced Amex and voila, it was free :) plus a reduced Biba bikini in HoF cost me only £20. The best part is that it works in conjunction with other offers which we exploited to the full in Strada.